Yes! I do enjoy Godzilla films quite a bit! So, you will probably see some Godzilla related stuff from time to time. 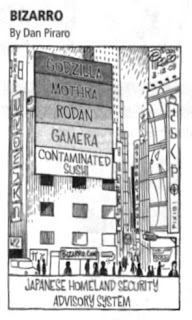 As to your point about Godzilla as a good guy, that is true for the later films in the 60's and early 70's. No doubt about it! However, in the original film he is clearly a bad guy, as well as in the next 3 films that follow: Godzilla Raids Again, King Kong vs. Godzilla, and Mothra vs. Godzilla. That also doesn't mention all the films from 1984 to 2004 where at best he is portrayed as a force of nature, neither good nor bad.